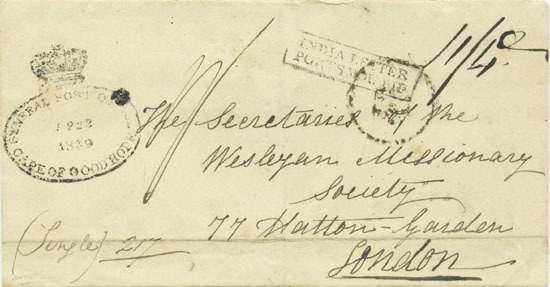 The postal history of the O.F.S. is extremely complex and is therefore of great interest. The postal markings have been extensively studied but, until recently, postal rates have received surprisingly little serious attention from philatelists. Of particular interest is early mail to destinations outside the O.F.S. as, until 1881, O.F.S. stamps had only local validity, so covers of letters to external destinations had to bear additional stamps from the Cape, Z.A.R. or Natal, depending upon the route, giving rise to the so-called combination covers. It was not until the Great trek that the Boers, dissatisfied with living under British control in the Cape of Good Hope, pioneered the areas beyond the Orange River. Thus the independent republic, the Orange Free State, was formed in December 1836. There were many difficulties, with repeated conflicts with both the Griquas and Basutos, often resulting from land disputes and cattle raids. An 1839 letter from a Missionary stationed at Umpukani to London, via Graaf Reinnett and Cape Town. Map (c. 1849) showing location of Umpukani in relation to Bloemfontein.